Cell-Mate Headlines: Never charge a Bluetooth headset again! Cell-Mate Headlines: Simple! Safe! Easy! Never settle for sub-par reception. Never worry about charging your Bluetooth headset. Never risk your safety trying to sync your headset with your phone while driving. Not only does the Cell-Mate fit all cell phones, but it is also great for cordless phones in the home. I never liked how my Bluetooth headset would have second rate reception. With the Cell-Mate, there is never a loss in reception because I am using the phone. This is perfect for when I am washing dishes. The phone would always ring and I would do the neck bend thing to talk. Now I don't have to worry about that anymore. The Cell-Mate is so simple it just works. Our gift line at Cell Mate offers gifts for every ocassion. Beautifully gift wrapped and presentable, suitable for grandparents, parents, teachers docters etc. available. 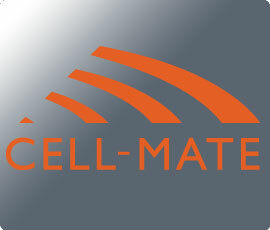 © 2012 Cell-Mate. A division of Accessories & More Inc.